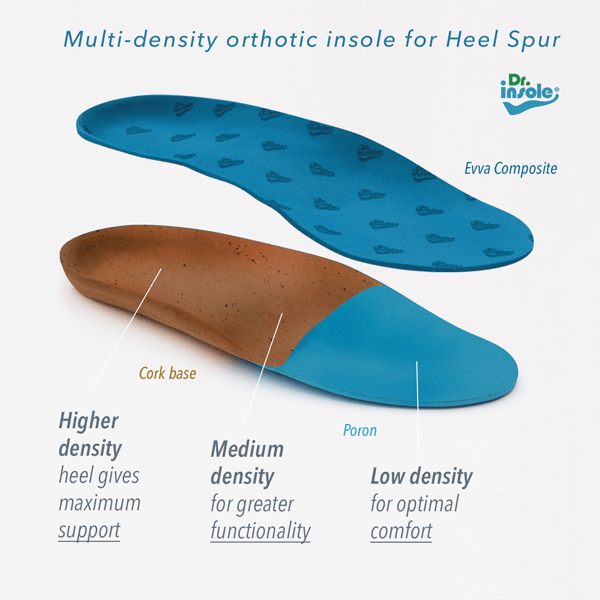 Dr Insole’s handmade orthotics will help cushion any heel spurs you have in your feet. Heel spurs can cause severe pain and discomfort, but using a cushioned top cover can help dramatically reduce the symptoms of pain. Our insoles help align the bones in your feet and providing appropriate cushioning, which can relieve pressure and strain on your heels. Using our insoles, alongside any other rehabilitation programme, will make heel spurs manageable. Our insoles are perfectly matched to your feet and made by hand, providing greater comfort and relief than prefabricated machine-made orthotics. You will immediately be able to feel the difference between poorly-fitted footwear, which exacerbates such conditions, and orthotics crafted specifically for your needs. We use carefully selected materials and pay great attention to detail in order to deliver the best solution for you. Heel spur, or calcaneal spur, is a result of calcium deposits that build up gradually on the heel bone. 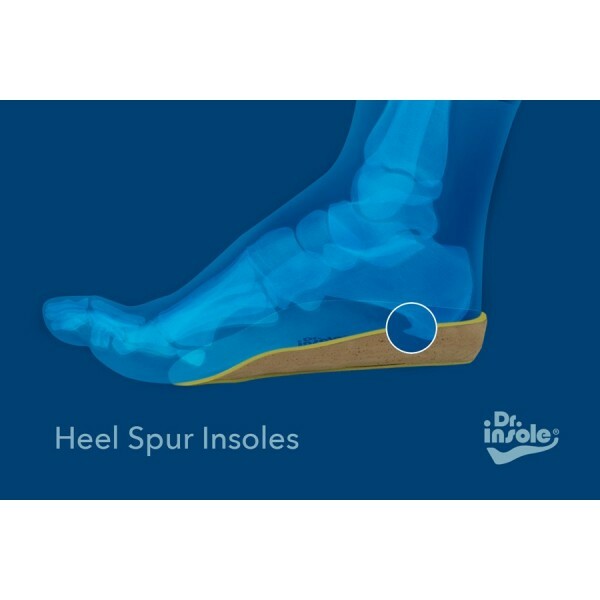 The occurrence of heel spurs is often associated with inflammatory processes in the plantar fascia – the thick band of connective tissue located under the sole of the foot that connects the heel bone and the toes. Injuries, repetitive stress and strains to the plantar fascia may cause small tears, damage and thickening of the tissue. Heel spurs can also be caused by excessive, prolonged strain on other foot ligaments and muscles, as well as from recurring tears to the membrane covering the heel bone. Over time, accumulating calcium deposits form into bony protrusions. What are the symptoms of heel spur? 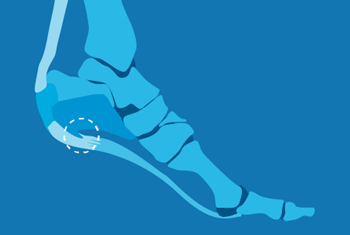 Heel spurs may be asymptomatic and they may not cause any heel pain or tenderness. However, as heel spurs are frequently associated with plantar fasciitis, pain and tenderness in the heel area may be a sign of the inflammation of plantar fasciia and the presence of heel spurs. Heel pain that is associated with plantar fasciitis and heel spurs is often stronger after longer periods of rest, e.g. after getting out of bed. It may also be exacerbated by high-impact physical activity and exercise. Heel spurs can be easily identified from an X-ray image. What is the treatment for heel spur? Wearing appropriate footwear and reducing strenuous exercise is often necessary in order to reduce the heel pain and discomfort associated with heel spurs. Stretching exercises and physical therapy often help relieve the painful symptoms of heel spurs. Anti-inflammatory medicines are used to alleviate heel pain. Sometimes, cortisone injections are recommended to decrease the inflammation in the heel area. How can Dr Insole’s orthotics help? Custom-made insoles are used to correct any biomechanical issues which contribute to heel pain. Made-to-order shoe insoles align feet to achieve optimal position and reduce excessive strain and pressure on foot joints and ligaments. Appropriate arch support and cushioning, in conjunction with the correct medical care, can help reduce symptoms of heel spur. 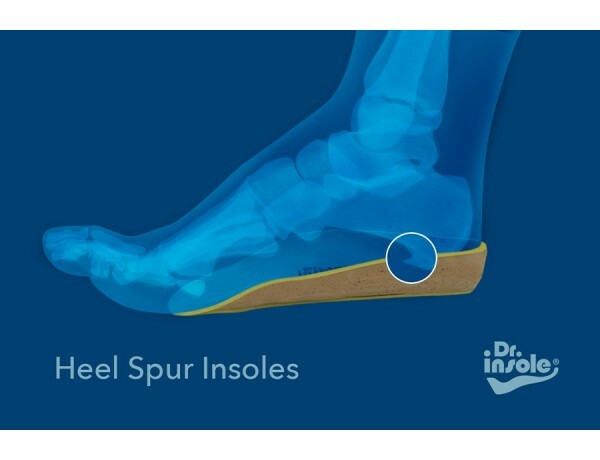 Moreover, wearing orthotic insoles for heel spurs allows for additional cushioning and protection of the affected areas. Our one-on-one consultations will allow us to arrive at a solution that addresses your specific needs. Heel spurs (Calcaneal spurs) are build-ups of calcium that are caused by excessive stress being put on the heel area. This can come about because of high-impact activities such as runing or dancing. Our bespoke insoles will act as a cup to cushion the heel and reduce the stress placed on the heels.